PLEASE, no multi invitations or self promotion in your comments, THEY WILL BE DELETED. My photos are FREE for anyone to use, just give me credit and it would be nice if you let me know, thanks - NONE OF MY PICTURES ARE HDR. This is the inside of the school house. The flag (Red Ensign) is the one Canada uses before the maple leaf flag we have now. Also to the right is a picture of Queen Victoria. A hundred years ago in Nova Scotia many of our schools were just like this one with many different age students taught in the same class. Can you imagine having grade 1 through to grade 10 students, all in the same room? Better yet, with very little paper to write on. What did these children use, slate and slate pencils. They also used quill pens made from goose feathers. 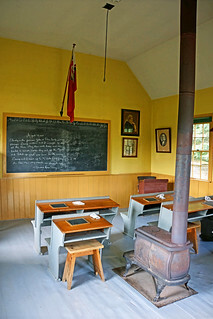 Students may have even carried firewood into the school, which is used for heat in this little one room schoolhouse.